RESIDENTS’ anxieties have well and truly surfaced since the controversial £4 million Coign Church site plans were submitted to the council. They say the serious concerns they expressed in June, after what they found to be a ‘misleading’ one-day-only exhibition by Bouygues Development, have been disregarded. 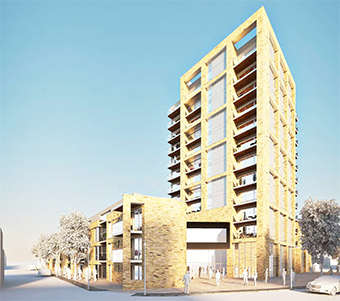 Residents would welcome regeneration of the area and church, but they feel the proposals for a 12-storey block with an auditorium of 850 seats, plus two ‘three or four’ storey buildings housing a total of 85 apartments, are ‘ill-conceived’ and contravene council guidelines. Although Bouygues have made provision for an underground car park with 82 spaces, neighbours say only 32 have been allocated for residents; the remainder are for the church. One angry Oak Road resident, Fred Griffin, told the News & Mail: “Parking is already a nightmare – it’s saturated around here. And the tower breaks all the rules – it is just a solid slab. They cannot build a tall block when it is surrounded by small buildings. “The council’s Core Strategy 21 says: ‘Developments must make a positive contribution to the street scene and character of the area, paying due regard to scale, height and proportions of surrounding buildings’. “This is in contravention of that. The developers are trying to base their case on the site being within the high-density housing of the town centre, which it is not. As well as the threat of increasing the already congested traffic and excessive demand for parking, the area has been blighted by flooding and sewage blockages for the last 15 years. Vale Farm Road resident Martine Cooper said: “Ever since the sewer was diverted in 1999 at the town end of the road, there have been flooding issues and sewer blockages. Surrey County and Woking Borough Councils, along with Thames Water and the Environment Agency, have commissioned a company called Atkins to do a survey of drainage in the area. Residents were given questionnaires and CCTV has been installed in the sewers. They are waiting for the assessment. The council’s Development Control department stated that ‘Surface water storage/drainage is the responsibility of the developer. Development shall not commence until drainage work has been approved’. When the council distributed notice of the current proposals to householders, they inadvertantly sent the previous plans for 170 homes. Residents received the correct notice on Saturday. On Monday, when the News & Mail alerted Bouygues that the plans for 170 homes were on the website, the correct plans went on the website that evening. However, the previous plans were also still on the website. TO VIEW the correct application for 85 dwellings, go to the planning page at woking.gov.uk and enter PLAN/2014/0941.